Camping Goes Glam at the Four Seasons Tented Camp Golden Triangle in Thailand. I’m about to disrobe and lie down on the massage table on the balcony of my ‘tent,’ which, at the Four Seasons Tented Camp Golden Triangle, looks more like a luxury suite, when four elephants and their riders go thundering down the trail directly below me. 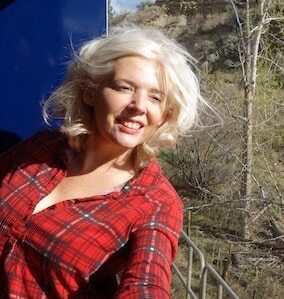 I lean over the rail and watch the elephants’ gigantic behinds as they disappear into the trees. Evidently, humans aren’t the only residents at the swanky Four Seasons Tented Camp Golden Triangle up in the far reaches of northern Thailand. A number of rescued elephants call it home also. “I will cover you,” Nat says. True to her word, she expertly hustles me onto the table all the while hiding me under a sheet. In the sultry air doves sing, bamboo leaves rustle and I relax into a state of bliss. Here in the notorious opium-growing area of the Golden Triangle, a lush mountainous region where Thailand, Laos and Myanmar (Burma) intersect, The Four Seasons Tented Camp is about as exotic as luxury travel gets. 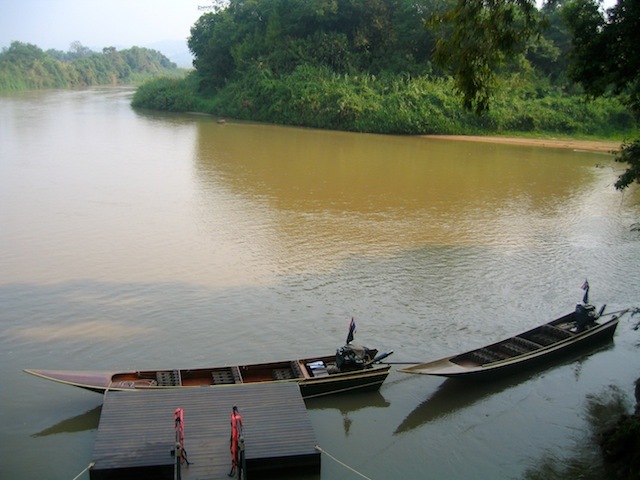 While tourism has overtaken opium as the number one cash crop, with tour buses flooding into the nearby village of Sop Ruak during the day, the atmosphere at the Four Seasons Tented Camp, only accessible by boat, remains remote and serene. At night, when long tail boats slip mysteriously downstream toward the Mekong River, there is still the sense that underneath the tourist gloss, the area retains some dark secrets. “May I put the poultice into your body now?” Nat is holding a loaf-sized muslin sac, fragrant with camphor and lemongrass. It takes me a minute to realize she means into my pores rather than an orifice. The hot sacs are used to massage my limbs, helping me unwind from the 4-hour drive north from the city of Chiang Mai. Though I probably should have had my massage, the Mahout Recovery Treatment, after I’ve actually done the mahout, or elephant training, it still feels superb. If any culture understands pampering it’s the Thai. When Nat places the hot poultices between my thighs, however, I wonder just how gruelling tomorrow’s elephant training is going to be. The elephants are momentarily forgotten when I enter my tent. The walls and peaked roof may be canvas, but the layout is palatial, harkening back to 19th-century adventure expeditions. The Four Seasons Tented Camp Golden Triangle takes ‘glamping,’ a combination of camping and glamour, to a sophisticated extreme.Recycled teak floors, hand-hammered copper tub, king-size bed and private outdoor shower coexist seamlessly with modern amenities like WiFi and climate control. Outside, my sun deck overlooks a hazy series of hills. 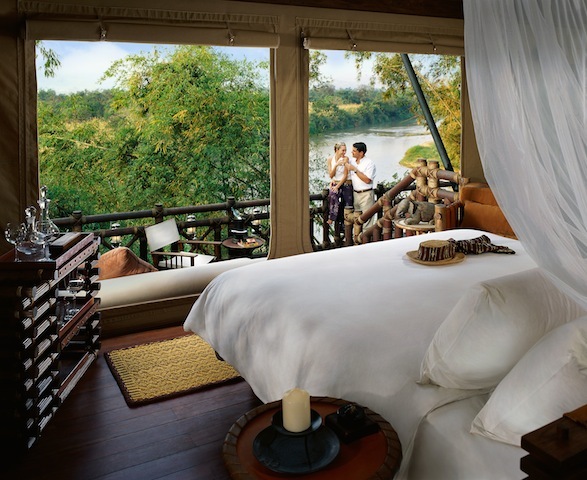 For all the lavish décor the Four Seasons Tented Camp is no sedentary vacation. Designed for active adult travellers, it consists of fifteen lofty tents stretching out along a 1 km trail, so just walking from the Burma Bar at one end to the Nong Yao Restaurant at the other can work up an appetite. Luckily the Camp is all-inclusive so hunger isn’t an issue. I’m solo, so I join the community table for dinner, a congenial mix of well-heeled globe-trotters. Hopefully the elephant will love me. That’s a lot of animal to get close to. The next morning, dressed in my blue pajama-like mahout (elephant trainer) outfit, I’m ferried out to the Four Season’s elephant camp at the tip of a small peninsula. The staff hoists me onto Camoon, a middle-aged elephant with crusty eyelashes, sleepy eyes and pink and grey spotted ears. Behind me, Tee, a genuine mahout sits ready to grab me if I should slip. With nothing to hold onto except Camoon’s floppy ears, it’s a wild ride into the Ruak River as we plunge down the bank. 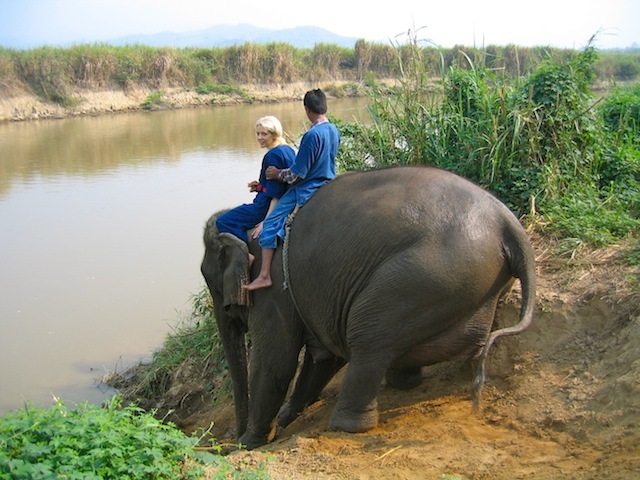 Then playtime begins, the mahout splashing water onto Camoon’s head, spraying me in the process.“Are the elephants happy here?” I ask Tee. I manage to hang on while Camoon clambers up the bank. While she’s drying off and snacking on sugarcane, I sit at an outdoor table with a white tablecloth, eating fresh fruit and learning elephant commands. Then I’m back on Camoon, riding alone. Crouched on her neck, my bare feet tucked behind her ears, I lead her around an elephant obstacle course, practicing commands like turn, stop and go. Other than a few inexplicable side trips into the bushes it goes pretty well and I dismount proudly. “Tak tun,” I say nervously. Camoon kneels and bows her massive head, waiting for me to jump up straight on. I’ve played leapfrog before but not onto an elephant. What if I accidentally kick her in the eye? Still, I can’t leave her sitting there, so I take a giant bound and wriggle over her head. Ringling Brothers here I come. While I can’t say Camoon appeared to develop a special bond with me, no matter what I was secretly hoping for (although she did seem pleased when I gave her a snack), it was truly an epic adventure, a once-in-a-lifetime luxury trip, and the fact that the rescued elephants are so much better off at the Four Seasons Golden Triangle Tented Camp than they would be either slaving away in the bush for loggers or being paraded down the streets of Bangkok for tourists, helps ease that residual guilt that seems to arise with any wild animal encounter. After that it’s an easy ride through the jungle back to the Tented Camp, interrupted only when Camoon is startled by a coucal bird. I pat her neck reassuringly and we fall into a contented rhythm. Who needs opium to get high? 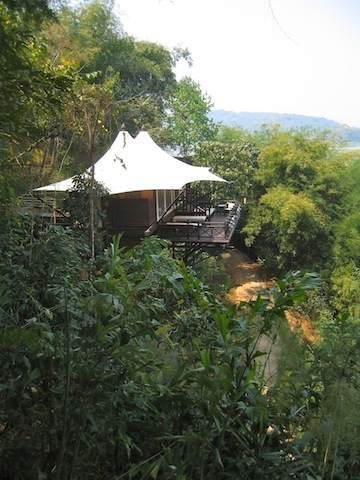 Opened in early 2006, the Tented Camp Golden Triangle is the Four Season’s first all-inclusive jungle experience. With a maximum of 30 guests and a staff of 80, hospitality reigns high. It’s supremely deluxe, but guests should be aware it’s designed for active vacationers and a lot of walking is involved. Optional activities include spa treatments, Mekong River excursions, hikes and elephant mahout training based on an ancient Thai tradition. Camp facilities include a pool, a yoga pavilion, spa and trading post. The restaurant serves both Eastern and Western cuisine and has a well-stocked wine cellar. Culture buffs should make a side trip to the nearby Hall of Opium, Golden Triangle Park, a spacious museum and research centre that illustrates the history of opium and educates people about the impact of illegal drugs. Getting There: It’s a long way away from North America, but worth it to check out one of the globe’s hottest properties. From Bangkok, Thai Airways flies to both Chiang Mai and Chiang Rai. 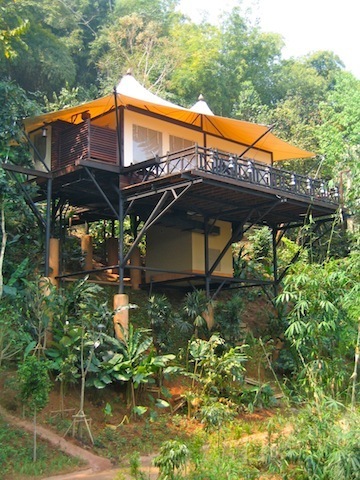 Camp packages include airport transfers from the northern Thai city of Chiang Rai, 100 km south. SUV pickup can be arranged from Chiang Mai at an additional charge. 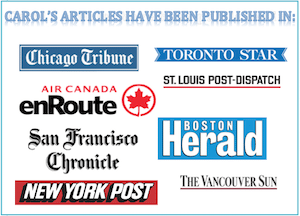 Read how this article was stolen! Craziness! I originally wrote a different version of my visit to the Four Seasons Tented Camp Golden Triangle for the Toronto Star. Someone ‘appropriated’ it, translated probably into Thai, it may have been again ‘appropriated’ and translated back into English. This is the hilarious outcome. If it wasn’t so funny I’d cry.